Our Lady of the Sacred Heart School, a Catholic school in the Diocese of San Diego, is promising to focus on the academic, spiritual, cultural, and social needs of its students and their families. Our Lady of the Sacred Heart School, is promising to recognize, celebrate, and build upon its history of unique family values and traditions. Our Lady of the Sacred Heart School, is promising to recognize and include the diverse cultural and economic needs of its neighborhood. Our Lady of the Sacred Heart School, is promising to be aware of and fulfill the Scriptural values of unity, reconciliation, and working together to create a healthy community. Students at Our Lady of the Sacred Heart Catholic School receive education that develops the whole person: mind, body, and spirit within the daily living experience of their family, the Catholic Church, and society. Our Lady of the Sacred Heart Parish School (OLSH) has been serving the City Heights community since 1927. Dedicated faculty and staff continue to provide a value-centered learning environment and quality academic education. Students are actively involved in community and world outreach readily sharing what little they have. + Our goal is to develop children holistically–body, mind, and spirit. Therefore, we offer a solid academic program, after school activities, daily prayer, and weekly celebration of liturgy. 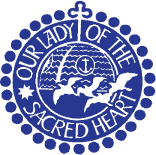 + Our Lady of the Sacred Heart (OLSH) school is an eductional ministry of Our Lady of the Sacred Heart Parish. We are affiliated with the Roman Catholic Diocese of San Diego and adhere to Diocesan Policies. + We are active participants in the Sisters of St. Joseph of Orange Educational Network. + OLSH is a comprehensive Preschool, Elementary, and Middle School accredited by the Western Association of Schools and Colleges in conjuction with the Western Catholic Education Association. + Our teachers hold credentials by the State of California. They are qualified, competent and enthusiastically committed to Catholic Education and the well-being of all children. + OLSH does not disciminate against any applicant, employee or student, on the basis of race, color, gender, religious preference, nationality or ethnic origin in the administration of educational policies, athletics, and other school activities. + We are easily accessible from I-8, I-805, I-15, HW94, and HW163. + To assist our families, we offer a "home away from home" in our Extended Care Program that opens at 6:30 a.m. and closes at 6:00 p.m.